It’s difficult to say, really, what happened at Sam’s River. Firstly, Sam’s River Trail’s existence is a debated subject. We found it in an old guide book at the beach cabin we stayed at. Washington Trails Association claims it doesn’t exist. Other places call it Queets River Trail. Physically, it may still be down a gravel road off Queets River Road. The beginning of the trail was an abandoned cabin with nothing but a brief sign warning about bears. There was no one else there and nor did it seem there had been for quite some time. Near the beginning of the trail, we came across a tree snapped in half with massive claw marks going up to the snapped point. Shortly after that, the trail divided, half of it going off the edge into the river. At this point, we began to hear distant scream-like howls. We kept going. A couple miles in, the trail followed a small stream into what I can only describe as a swampy meadow. Vine maples and saplings filled with Swainson’s Thrushes and robins presided over a lush field of green grass, all inundated with water. At the edge of the meadow, the trail transformed into a stream and then disappeared entirely. The guidebook said that the trail was a loop, so we (my family and I) fanned out to find the trail. We found a trail. Then another one. The meadow was webbed with many narrow trails all leading in different directions. Eventually, we picked one and walked on. A few miles more, and we had reached the supposed length of the loop trail. We had not made a loop and were far from our starting destination. The howls were getting closer to us (or we were getting closer to them), so we decided to turn around and go back. We returned to the car without incident. 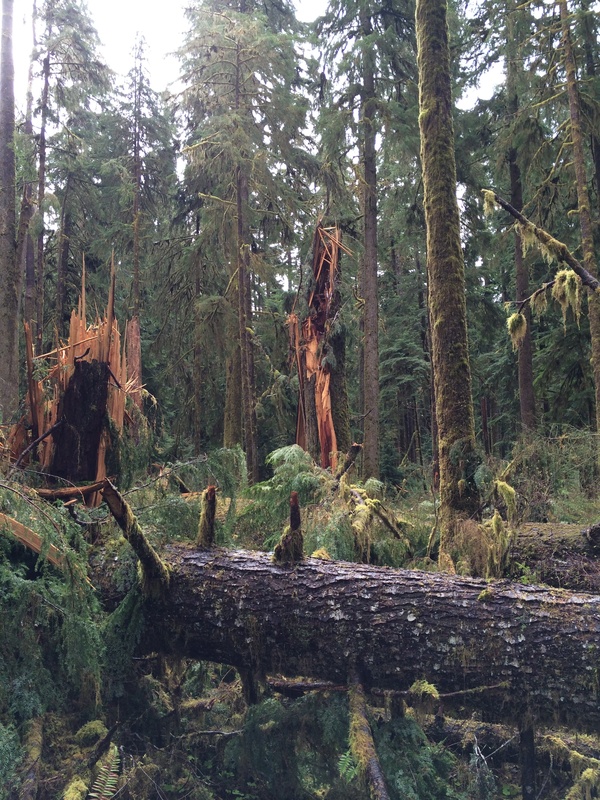 Attached image is of the knocked over trees. Trees of that size usually bring up the root ball when they fall.